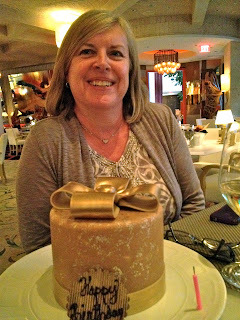 LAS VEGAS DAZE: The birthday and summer grazie gift show TR! The birthday and summer grazie gift show TR! I was looking forward to seeing my friend Terri again and having fun again with Gwen (yourstarla) and our birthday girl Liz (Cassley). When my boarding pass for Southwest ended up for the first time A1, it felt like the first win of the trip! Flight was alright though we landed in high winds. Palazzo's limo was waiting and my luggage was among the first few suitcases out of baggage claim. VIP check in was quick and gave me a coupon book for their 3 months of Carnevale celebrations which mainly consisted of discounts at restaurants and shops, though it did have a coupon for a free Carnevale cupcake! In addition to all the live entertainment for Carnevale such as the living Mona Lisa above, I was there on the Grazie Summer Gift promotion and it was currently triple point days for earning additional gift points. Since Liz and Gwen weren't due in until Saturday and I had a few hours to kill before meeting Terri, one of my best friends for dinner, I went right to the slots after unpacking. 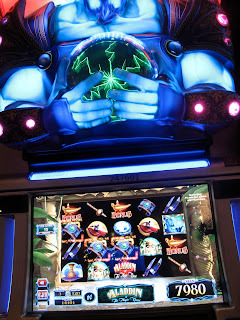 My luck so far in 2012 has been really sour and I was hoping for a winning trip. I quickly lost $200 through the $1 Quick Hit Slots in the Palazzo High Limit Room and then the $5 Wheel of Fortune slots outside. 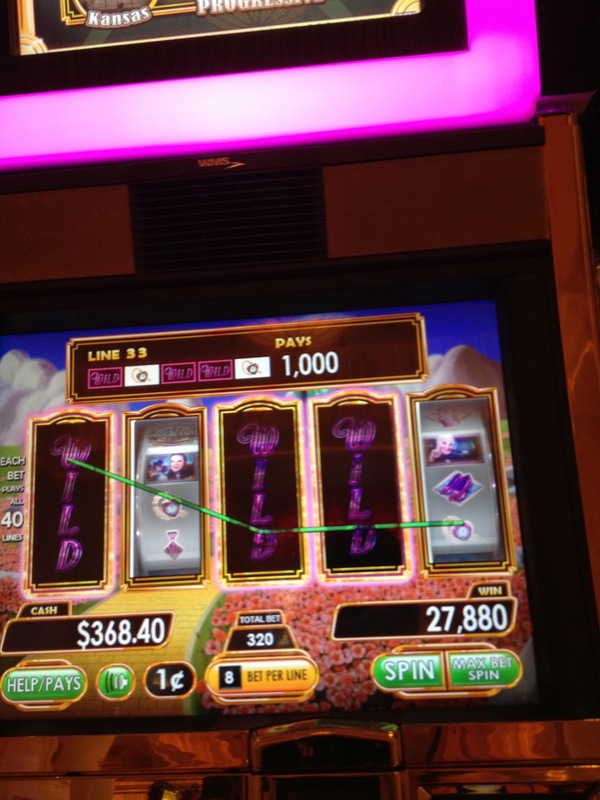 I decided to walk over to Venetian and play the Showgirls penny slot and I did hit a bonus on that for $185.00. 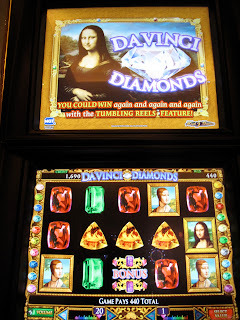 Feeling my luck might be changing I entered the Venetian High Limit room and started playing my beloved $1 DaVinci Diamonds which quickly rewarded me with a win of $310.00. 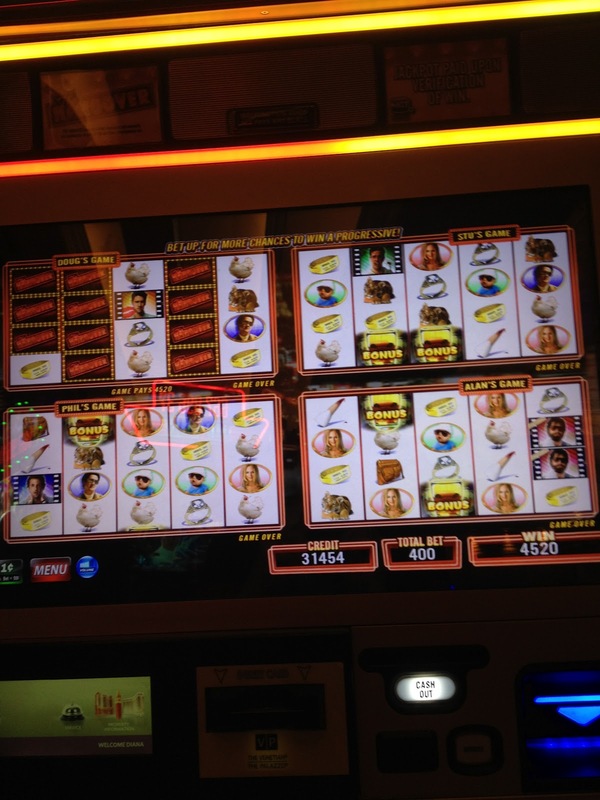 Another quick win of $260.00 was making this trip's gambling start out promising! 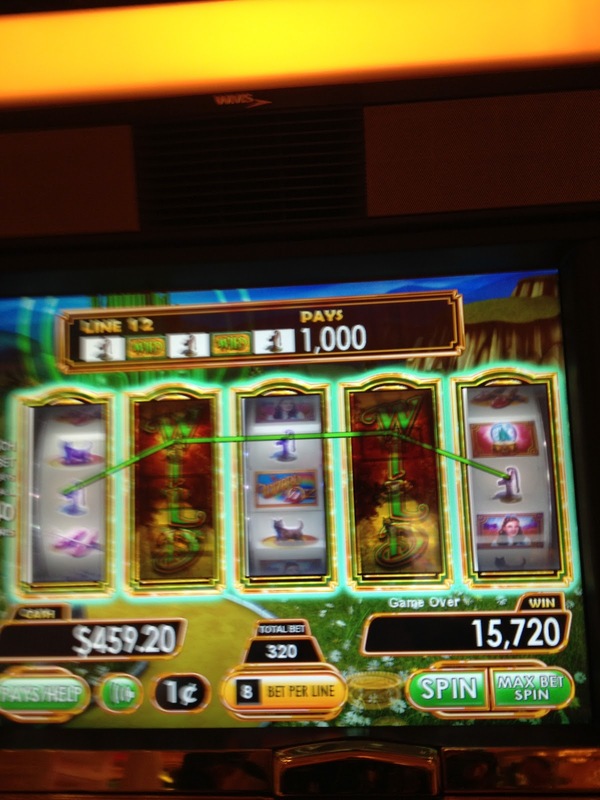 It was great to see some wins again on this slot as the last couple trips it had been very stingy. Moving over to $1 Jackpot Party at $15 a push I didn't get to a party bonus but I hit a great win of $1010.00. 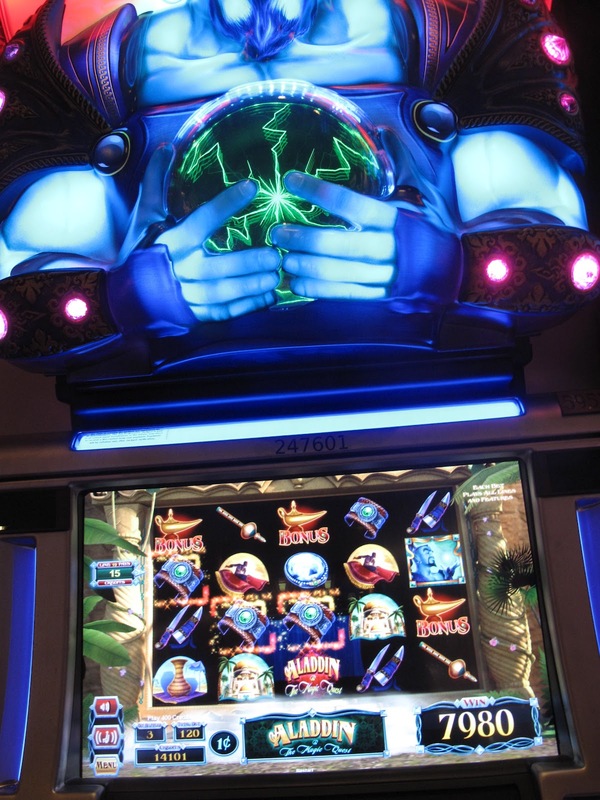 This was more like it so I went over to $5 pinball at 2 credits a push and hit a bonus for $400.00! Yippie ki yay! I was on a roll I thought, so I threw caution to the winds and started playing $1 Diamond Queen. While I did hit for $100 on it, I quickly started to go backwards with more losses then wins. Decided to give my husband's favorite $5 Triple, Double Cheese slot a try and won a bonus of $350.00 on it. 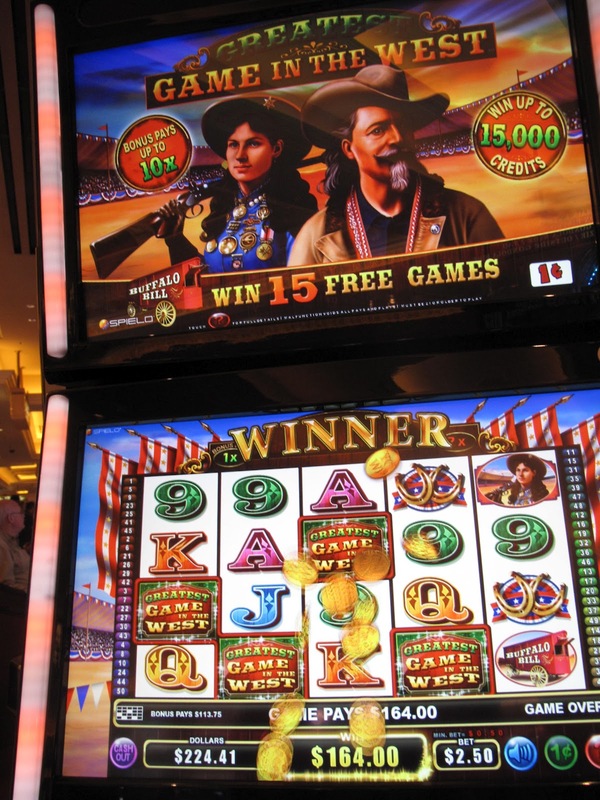 Unfortunately I went back to this slot several times during this trip and could never get the bonus again on it, so ended up losing the $350.00 I won on it and likely more. 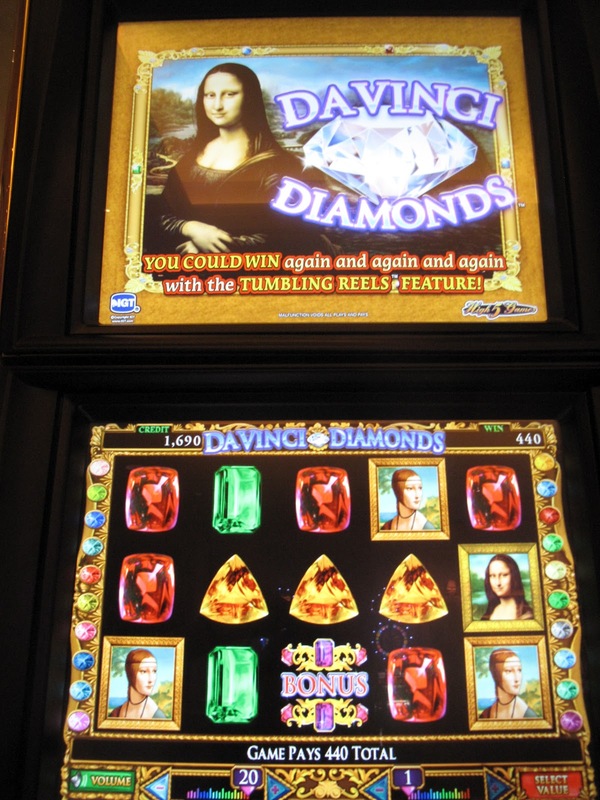 I tried a few more slots like $1 Zeus and was losing so returned to $1 DaVinci Diamonds for a quick hit and run that resulted in a $440.00 win. Feeling the force or something was with me I went for $1 Goldfish and while I had a win of $100 on it, could not get the bonus and started to lose. 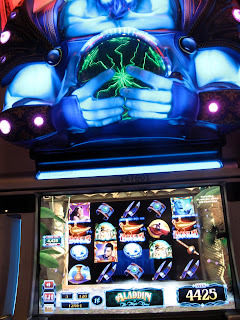 After Goldfish it was time to take my leave of the Venetian High Limit room while I still had some of my winnings and I was off to play some of the new slots like Elvis, Wicked Winnings 3, Monster Jackpots to name a few. 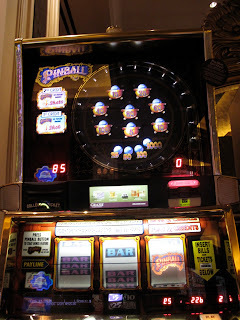 It turned out I could lose almost as fast on them as the high limit slots and my winnings were soon gone with the wind! 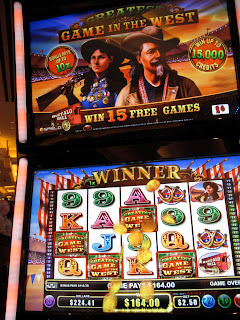 Gone with the Wind by the way is a new WMS slot that's now at a couple casinos though I didn't get a chance to play it this trip. Walking back from Venetian to Palazzo to change for dinner I stopped and watched the art exhibit for Carnevale and this week part of the exhibit was a man making ceramics. 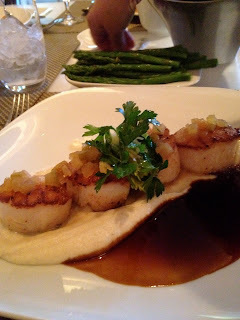 Terri (Socalgirl) picked me up for dinner, as we were eating at Bellagio's Prime Steakhouse for dinner. We had a fabulous table overlooking the fountains thanks to my NOIR status with M-Life. 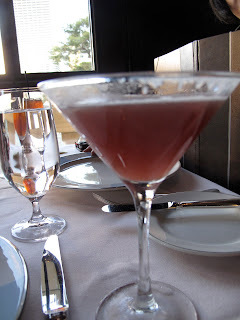 So far the best perk for me with NOIR has been that if you tell them in advance you are NOIR you do get the best tables at the restaurants and the servers seem to be a bit more attentive too. NOIR also gives you guaranteed limo service to and from the airport when staying at a M-Life hotel which is also nice but other then these perks, so far I don't find NOIR much different then Platinum status with M-Life. Our server suggested I try their French Martini which was just sweet enough without being cloying. Our bread basket came with butter that I think had lime sprinkles? I don't use butter so I'm not sure. The pretzel and fruit and nut bread was tasty. Terri really like her baby iceberg wedge salad with bacon and Maytag blue cheese dressing. I started to order a salad with steamed shrimp and Terri said aren't you going for the bacon wrapped shrimp, so I ended up asking our server which one he would suggest and ended up with the Bacon-Wrapped Shrimp with passion mustard and cumin scented honey. 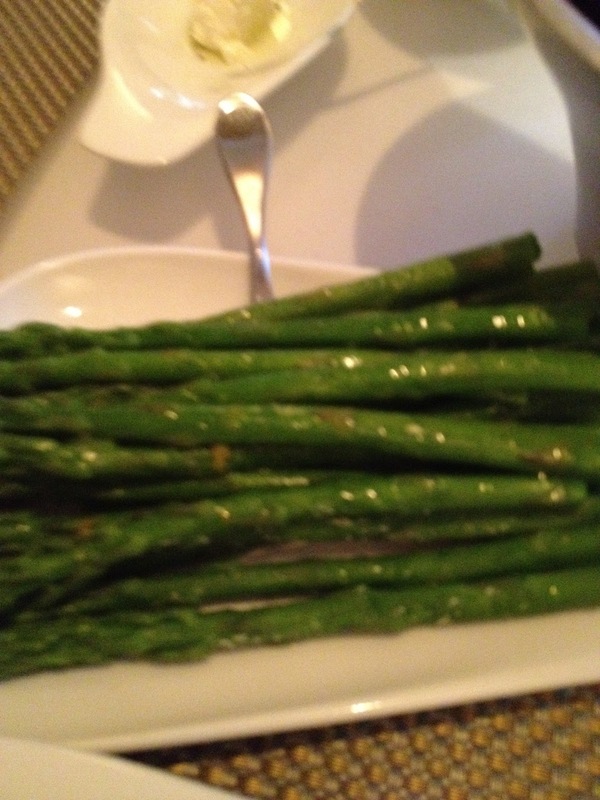 It was delicious, thank you Terri! I'm not sure why I ordered onion rings as a side, I think it's because someone on Yelp mentioned they were good, but sadly I thought they were not up to par at all so they went uneaten. My filet mignon with shishito peppers was very good, but I would give a slight edge to the filets I've had at Cut mainly because mine was slightly over cooked that evening. The three steak sauces they serve with the filet are peppercorn, béarnaise and miso-mustard and I liked all of them. Our side of asparagus was cooked perfectly. Terri's side of crunchy potatoes with white cheddar and creme fraiche was outstanding! 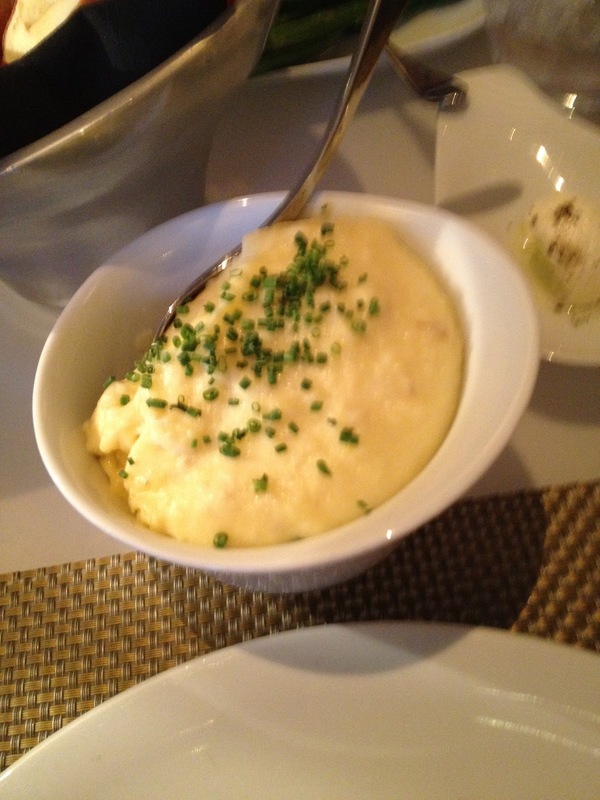 I loved my coconut soufflé, though again I would have to give the edge to Cut's chocolate soufflé. All in all a enjoyable dinner with great service, lovely view, good food and of course fabulous company! 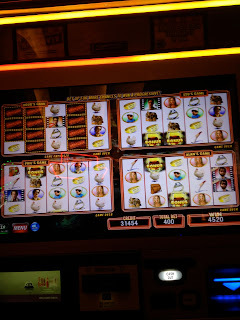 After our dinner at Prime, Terri went off to try her luck at Bellagio and I had a short but very pleasant Meet with Patricia from the Slot Machine Forum. 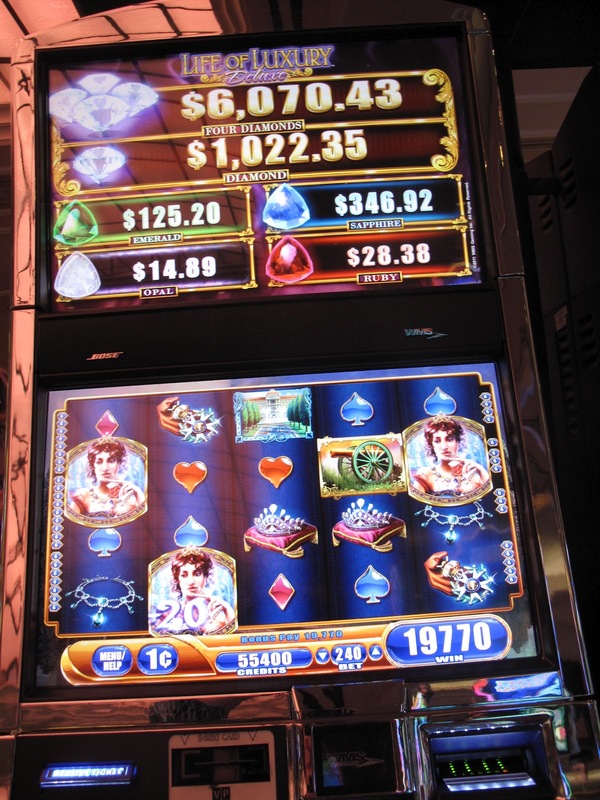 Patricia was having a very lucky trip at Bellagio and I believe came home with some nice winnings! After we left Bellagio, Terri briefly joined me at Palazzo for some gambling but had to get up early the next morning so we said goodbye until my next trip in mid-July. As always I had a lot of fun catching up with Terri but our visit this trip was too short so I'm glad we're getting together again in July! After Terri left I finally found a open seat on Aladdin which being new and fun is a very busy slot currently in Las Vegas. 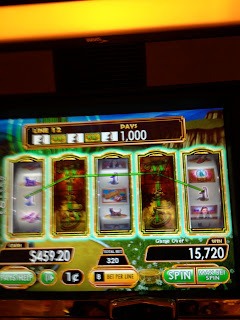 At first I wasn't doing much but finally hit the bonus upon which the slot froze went dead, then rebooted and about 8 minutes later reset, so I could finally play my bonus for a win of $79.80 on a $1.20 bet. Even though I had seen people earlier in the day hit bonus after bonus on the slot I was playing, they were few for me so while I love this slot I decided to leave it and return later. 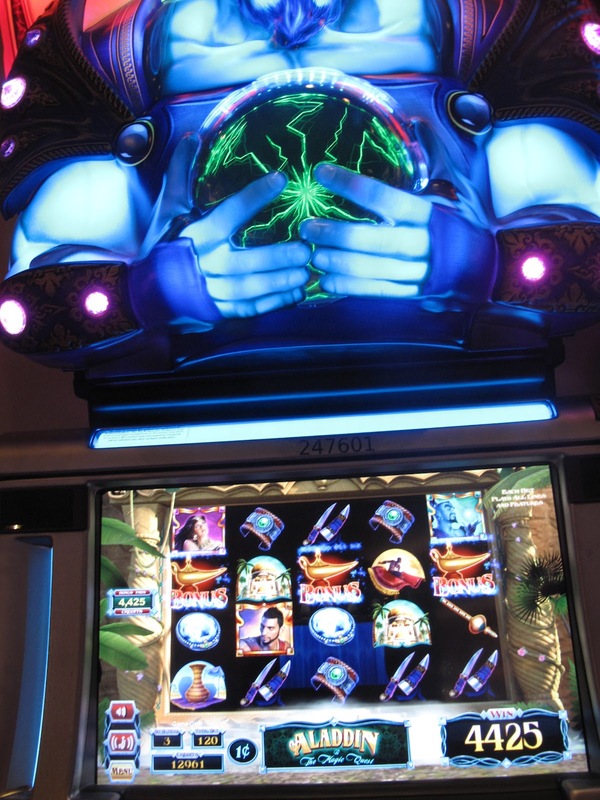 Walking back to Venetian I found the casino very busy with most of the new slots taken. While my old love the original Wizard of Oz hasn't been very kind to me during the last year I decided to play it and was thrilled to get a visit from Glinda for a win of $526.00. After Glinda I played a bit of Epic Monopoly but while I like this slot it just wasn't very lucky for me this trip, though tonight it gave me the bonus above. 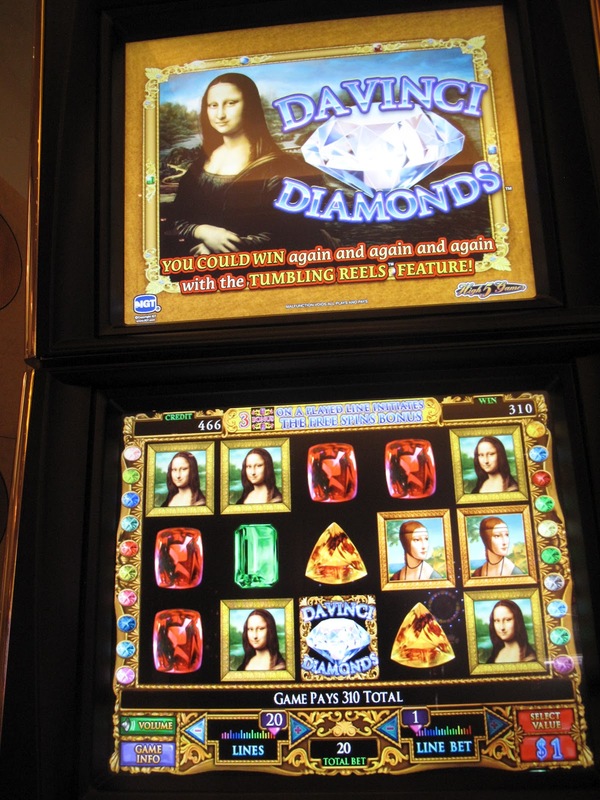 It was around 3am or so in the morning by now and I walked back to Palazzo to try a few more slots before going to sleep and had some fun on Clue. I was betting $1.20 a push when I hit this bonus for $108.00. I played my favorite Wolf Run for a while but it just wasn't very lucky for me this trip and the win above the first evening of my trip ended up also being my best for this trip for WR. 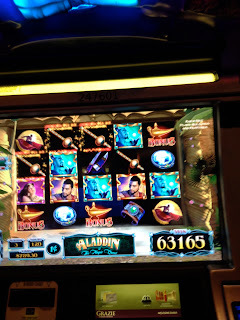 I walked by Aladdin and played it for a bit and while I couldn't get the bonus I had a nice hit of $144.00 on a $1.20 bet before going back to the room to sleep. I meant to sleep in on Saturday to be perky for Gwen and Liz's arrival but music from the pool woke me up along with very noisy housekeepers. After I got ready for the day and left the room to eat at Grand Lux I ended up getting off on the wrong floor so must be lack of sleep since I hadn't had a drink yet. 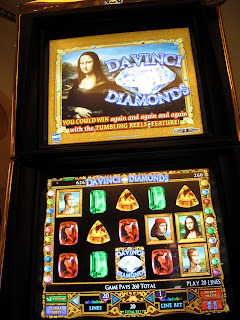 After enjoying my favorite Manhattan salad with chicken and shrimp at Grand Lux I played a bunch of slots from Aladdin to DaVinci Diamonds to take advantage of earning triple points for the Grazie Summer Gift Show. While I was playing my friends Gwen and Liz arrived and checked into their rooms at Wynn and Encore. Before walking over to Wynn to meet Gwen and Liz, I caught some more of the art on display for Carnevale. The photo above and the ones below were taken in the Palazzo waterfall area. The scorpion was interesting but it's not something I would want to buy and display at home. 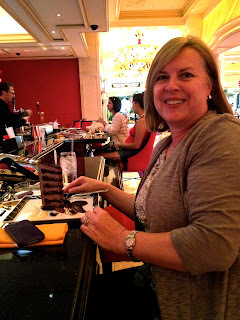 After strolling around Palazzo I walked over and met Liz at Wynn. 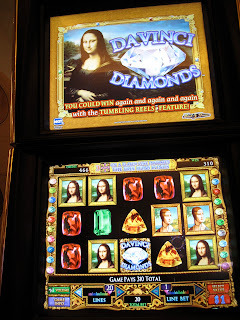 We played a bit of VP together and I quickly lost a $100, though I had some brief fun with the $1 DaVinci Diamonds before Gwen joined us so ended up not losing anything. Gwen caught up with us after that and we walked over to Palazzo where I introduced Gwen to the joys of playing Clue while Liz cheered us on. Clue welcomed Gwen immediately with a generous bonus while giving me not much of anything, but it was great to finally sit down and play slots with Gwen in one of our favorite casinos! It was time now to meet Liz's friend Cathy who lives in Las Vegas at Palazzo's Grand Lux where we were having dinner. Cathy was friendly and loves living and working in Las Vegas! 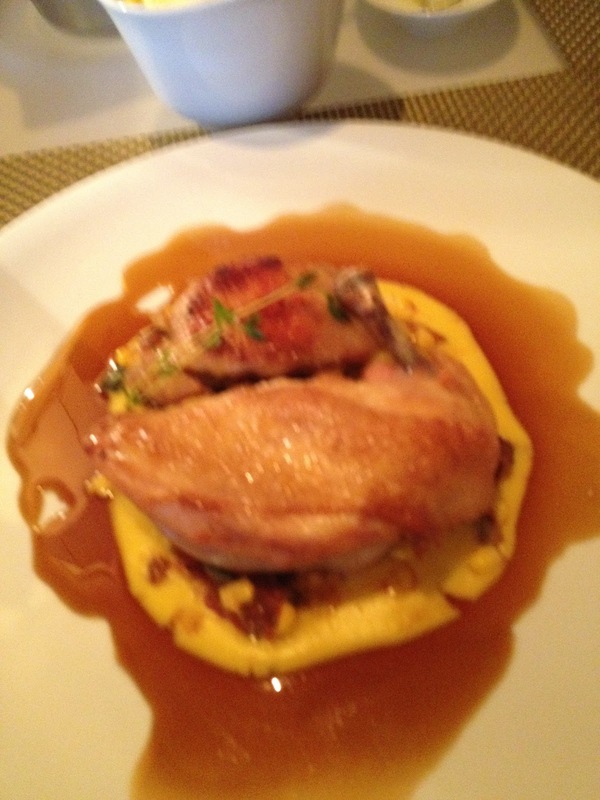 Above is Cathy's Chicken Royale which I was told tastes as good as it looks! Liz had the mashed potato stuffed spring rolls above which has to be delicious as she had been craving them since the last time she had them. I really enjoyed my cedar planked BBQ salmon with mashed potatoes and corn succotash. It was suppose to have onion strings/rings on top but they were still cooking them and brought them out later. Gwen said her turkey and brie was tasty and it certainly looked good so I might venture away from my favorites and try it next visit. Liz had a headache after dinner so Gwen bought her some Advil and we went off to the quiet of the Platinum lounge where I had a cappuccino and Cathy some Champagne. After the Platinum lounge we wandered over to the Venetian to check out the new Bourbon lounge and you can see above they had pulled someone from the audience into a jump roping costume with the staff. All of us thought the Bourbon Lounge looked like a fun replacement to La Scena but Liz and Gwen were tired and we said goodnight as we had a morning brunch planned the next day at La Cave. Of course I didn't go to bed, I had triple points to earn to turn in for gift cards tomorrow. 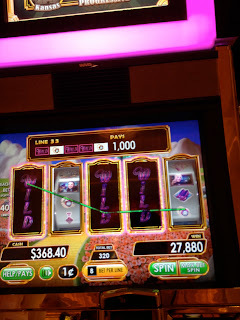 I've never played Ruby Slippers much since it came out because all I could seem to do was lose on it, but this trip I was thrilled when I tried it again and got a win of over $543.75. The wins on the original Wizard of Oz and Ruby Slippers continue that evening as I went back and forth from Venetian to Palazzo. It's been such a long time since I've seen Glinda show me some love I had almost quit playing these slots but now it will be hard for me to stay away from them in July! There were other wins and also losses that night but I had a lot of play for my money, racked up a lot of points and made Platinum again which will now be good until December of 2013 and by the time I went to bed I had recovered from earlier losses and had broken even. The next morning I was once against woken up by the party the housekeepers were having in their staff room next to my suite but since I had to get ready for Brunch with Liz, Gwen and Elizabeth at La Cave I didn't mind to much. Brunch was fabulous at La Cave. The only hiccup was when we waited past our reservation for Elizabeth and she didn't call or show up. I've already written my review of this brunch but if you missed it here's the link to it on this blog. After our brunch I split up from Gwen and Liz who were off to check out the Wynn Cabana's for one of the parties planned during our July trip, while I headed back for some last minute slot play for points before going to the Grazie Summer Gift Show which would be ending today at 5pm. 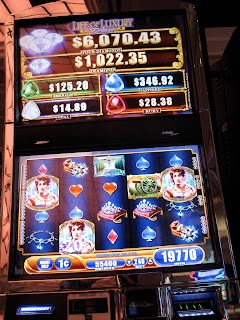 I tried Hangover at Palazzo but my lucky slot was not going to bonus for me this trip, so I went to my other lucky Hangover slot at Venetian and this one lived up to it's past history and I had one good hit after another with frequent bonuses. 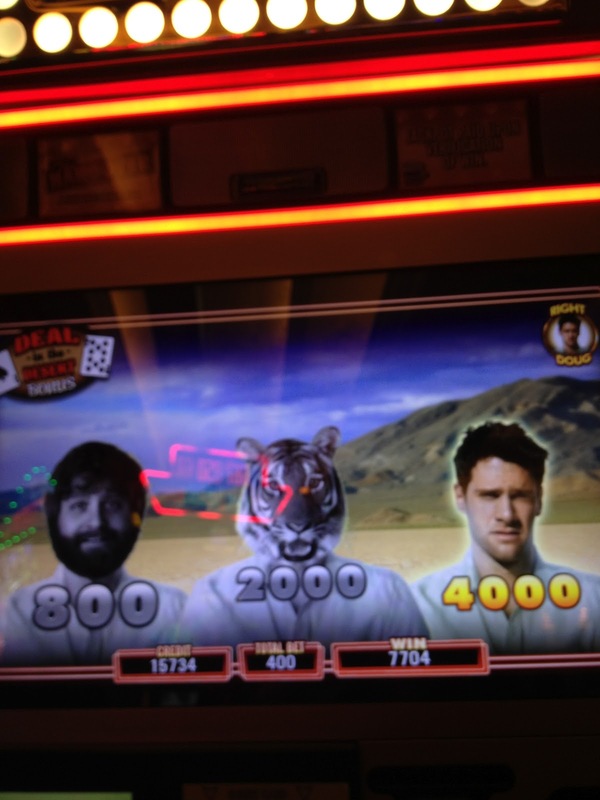 I love Hangover with the bonuses are active, so much fun even for a lousy picker like myself. After about a hour or so of Hangover it went cold so I started playing the original WOZ behind it and while Glinda generously gave me 3 wilds it only paid $60.00. The Last Emperor gave me some nice hits like this one for a couple hundred but I got mad at it when I hit the bonus and it retriggered which meant hundreds of empress wilds, but none of them would show up, so the bonus was less then the hit above. I was up and down all afternoon, the big win eluding me but having lots of fun and earning lots of points. It was time to hit the Grazie Summer Gift Show before it closed. It's set up and run the same as the Grazie end of the year Holiday Gift Point Party just with a summer theme. My big surprise as I was wandering around the show was running in to Rhonda and Toc, friends from the Slot Machine Forum! I met Rhonda and Toc last year for the first time at the Golden Greeke's Halloween Stumble Meet and they are a lot of fun! Lots of gifts on display to select from buy I ended up using the majority of my points for $650.00 worth of Best Buy gift cards and then some minor gifts for friends. They had a long line to stand in for checking submitting our clip board of gift choices. Fortunately for me they had a line with no one in it for Platinum members. However as I'm standing in that line waiting for the next check out employee to help me the woman in the front of the line for all other Grazie members looks over to me and tells me I'm in the wrong place and the line is in back of her. I politely replied that I was in the correct line for Platinum members and then she turns to the man behind her who I'm guessing was her husband and tells him they should have had a sign up for that then. Of course they did have a sign up that's how I knew where to stand but I wasn't going to argue with her about it, fortunately I was called up just then to check out. After they process our choices and have us sign for them we go to a waiting area for them to call our name to pick up our gifts that won't need to be shipped. While sitting down to wait for my gift cards, I smile at a lady who is sitting down nearby and looking at me and smiling back and next thing I know she is asking me if I'm Diana from this blog and Evoni on the boards and I'm having the pleasure of meeting Shoreline Paws from the Trip Advisor Las Vegas Message board! Meeting Shoreline Paws was a great way to finish up the Grazie Summer Gift Show! After the gift show I'm walking back from Venetian to drop off my packages and change my clothes for Liz's birthday dinner when I run into the walking 9 foot tall grape vines posing on the pillars. 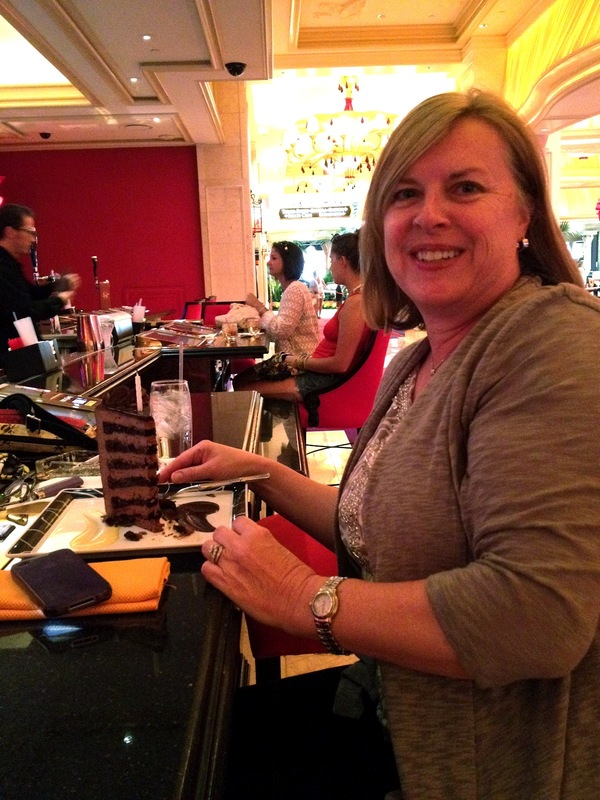 After changing clothes for dinner I walked over to meet Liz at Encore and found her with a huge piece of 12 layer chocolate birthday cake that her favorite bartender had gifted her with. Both Liz and I had a taste of the cake and it was rich and delish so Liz had her friend store it for her for later. Before dinner Liz returned to her room briefly on a errand and while waiting for her to return and Gwen to join us I played WOZ, Glinda the Good and had a visit from Glinda for $278.00. 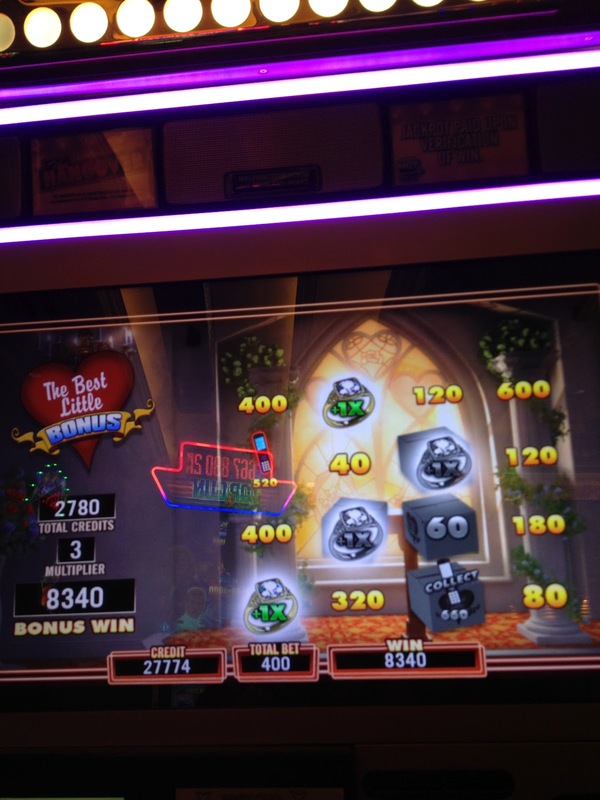 Since I like to hit and run I went to the Yellow Brick Road WOZ slot next and hit $157.20 on it. At that point Liz was back downstairs and Gwen had joined us so I walked away a winner at least briefly! Liz's birthday dinner was at Wynn's Lakeside restaurant and we were joined there by our friend Lemonlime who had gotten bored and flown into Vegas on the spur of the moment. Unfortunately right after we were seated and served our water Lemonlime took ill and had to return to the Mirage where he was staying. This was my second time at Lakeside as I was there last year on my birthday with my friend Terri. I loved Lakeside last year and it didn't disappoint this year. If you haven't tried it and the food on their menu entices you, go for it, you won't be disappointed. Above is my delicious Atlantic Scallops with celery root puree and apple chutney. Gwen's organic chicken looked great and I know she enjoyed it. All of our food at Lakeside was wonderful, including the sides we ordered. 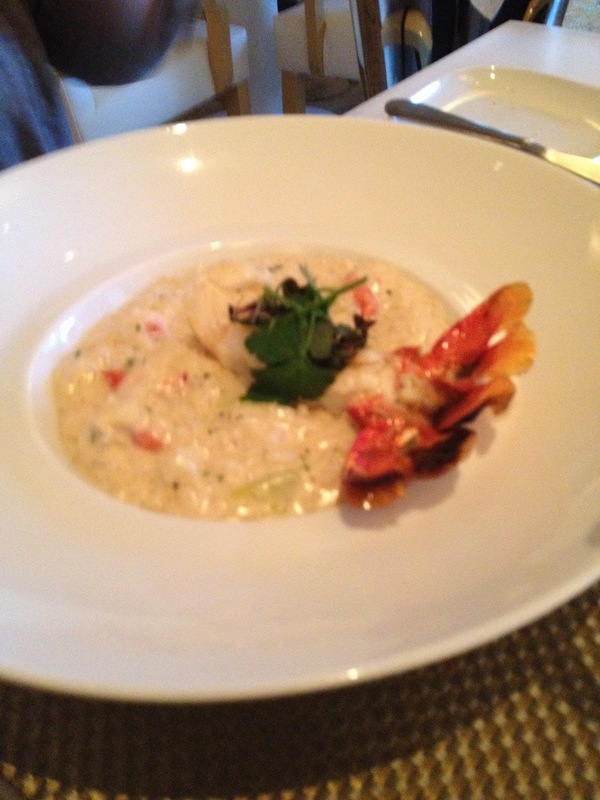 Above is Liz's Lobster Risotto. 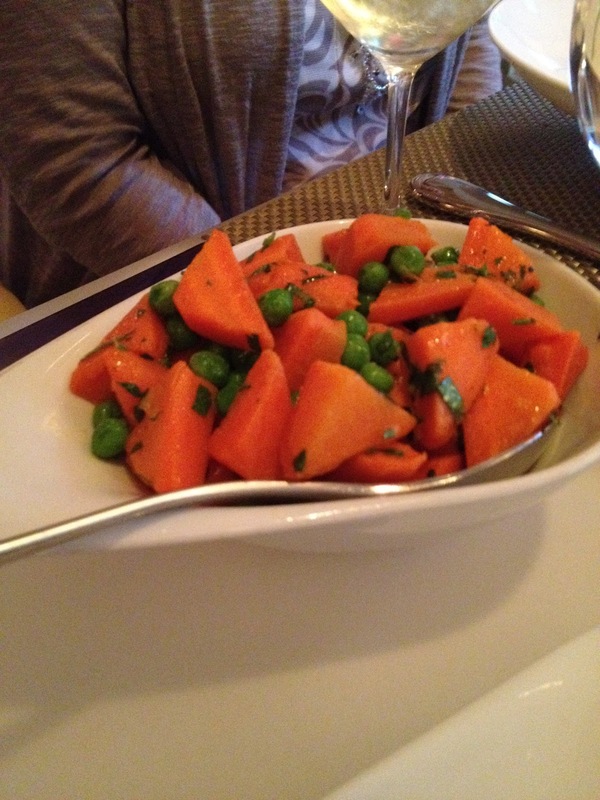 Carrots and peas, healthy but very tasty. Gwen had excused herself from the table near the end of our dinner to secretly arrange a cake for Liz only to be told there was one that had already been ordered. Surprise! They brought out this glowing gorgeous gold fondant birthday cake! Who ordered it? At first we thought Liz's husband, but when she sent him a text about it he said it wasn't him and of course immediately wanted to know who had sent his wife a cake. :) Once we knew it wasn't Liz's husband Gwen guessed it immediately and said it had to be from our friend Teresa (T-Bonz) and so it was! After our dinner Liz left to join her parents and Aunt and Uncle who had arrived in Vegas a few hours earlier and Gwen and I went off to play slots together at Wynn. Okay, so did I mentioned that Gwen wasn't feeling like drinking at dinner so Liz and I shared a bottle of wine? Well, I was a bit tipsy from my half of that bottle and I can't remember at all what slots Gwen and I played together other then I had a blast, and had a preview of the fun Gwen and I will have in July when we tear up the Venetian and Palazzo slot floors together! After I left Gwen at Wynn I walked over to Venetian to play Hangover which seemed appropriate since I might have one in the morning. The fellas recognizing a kindred spirit gave me lots of wins and bonuses for about a hour. 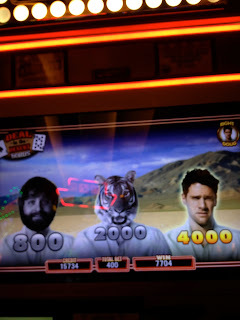 About the time my tipsiness wore off my luck with Hangover died so I went back to Palazzo with a mission to play Aladdin and hit some bonuses. I was quite happy to get some magic carpet bonuses that were giving me decent wins on a $1.20 bet. It's about 3am now and I'm getting ready to leave and go to bed when I hit the Clash of the Genie bonus and for one shining moment I finally pick correctly on multiple screens to win $631.65 on a $1.20 bet! 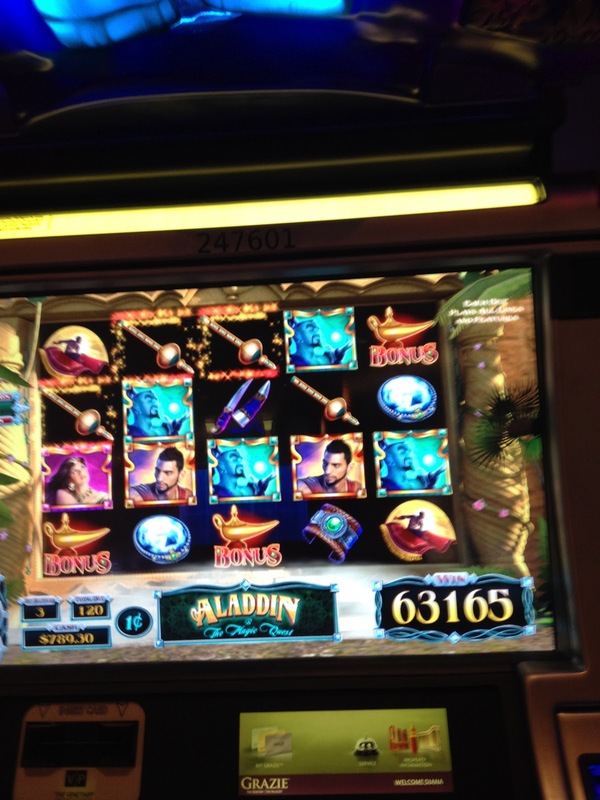 It's official I love the Aladdin slot! I was determined the next morning to sleep in late until lunch with Gwen but it was not to be, the housekeeping staff was once again shouting and laughing starting at 9am next door to my room. I staggered out of my room to have the Palazzo concierge print out my Southwest boarding pass and had a short wait behind this bride. As I'm leaving the concierge a troop of Carnevale entertainers start up their act in the Palazzo lobby. 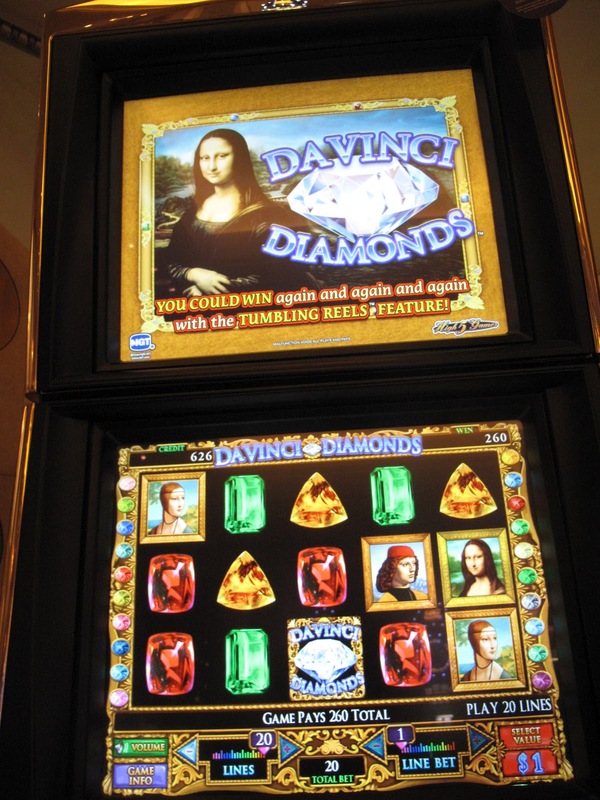 After that I played a few slots until it was time to meet Gwen at Delmonico's. Above is Gwen's lunch of tomato soup and a ricotta grilled cheese sandwich. If you have read any of yourstarla's trip reports in the past you know she loves bread and tomatoes! I had the grilled chicken salad with shrimp added to it. Very fresh and light, and just what I was feeling like. Gwen (yourstarla) and I had known for a few years now on TA that we had similar tastes but had never met in person until March at Teresa's fun birthday party. However there was so much going on that weekend with our large birthday group we didn't get to spend any one or one time together so it was great to get to know each better this trip. Same thing with Liz (cassley), while I've only been spending time with her now on three trips, it seems like we're been friends for a long time and I can't wait to see them both again in July. Gwen and I shared Emeril's fabulous banana cream pie for dessert! Try it, you will love it if you like pie and bananas! After lunch Gwen left for a Meet with some friends and I had a bit of luck with this Goldfish bonus. Before I left for the airport that evening I walked over to Encore to say goodbye to Liz and Gwen. Liz told us that the new Grease slot had just been installed at Encore so Gwen and I had fun playing that with Liz looking on. Liz earlier had some really great wins on Grease, and while I had some really fun bonuses, I eventually walked away a loser. I think Gwen did better on Grease then I did, plus right before we had met up again she had a great win playing VP at Wynn! As I was walking back to Palazzo to catch my limo to the airport, I ran into Lemonlime walking toward Encore and was happy to hear he had recovered from last night's illness and was feeling good. Lemonlime who was also at the March birthday party for Teresa is a really fun person to be around in Vegas and I'm looking forward to seeing him again in July when a lot of us will be back in Vegas. Next trip as mentioned is this month, July and I'll be staying at Palazzo for 3 nights starting the 19th, then at Wynn for 3 nights and finishing up with one night at Cosmopolitan! I'll be meeting lots of friends again this trip and regardless of gambling luck it's going to be a special and fun trip! Wow, thanks for the great tr! So enjoyed it, especially since I met a few of these lovely ladies in March but, like you, didn't have time to spend much of it with any of them. The pictures were wonderful, as usual. Thanks so much for posting. Enjoy your blog and TR's very much. By coincidence, I'm also at Palazzo starting on July 19th. I hope to run into you and thank you in person! Best of luck on your next, and next, and so on visits to LV. Thanks David! If you think you see me look for a headband in my hair to verify it's me as I always wear one in Vegas. :) Have fun and good luck! I'm a bit late to this, but thank you for posting. Tell me. 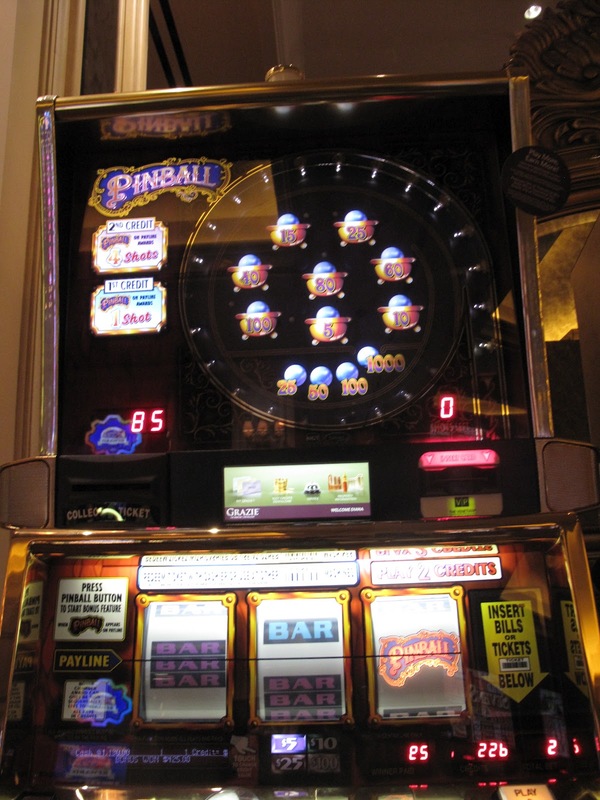 What is your favorite slot to play and why? 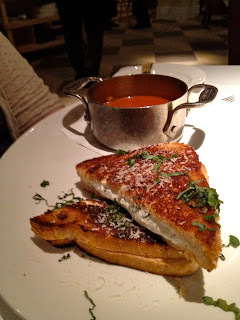 Your food reviews are terrific and right up my alley as another food conosoier. Keep the reports coming and thanks for posting. Craps1, I play the $5 slots now and then and my favorite of them is Top Dollar X2 X2 due to my 20k hit last October on one at Aria. With the penny slots it's varies. My all time favorites are the original Wizard of Oz and Goldfish, both of which have fun bonuses and I've had some nice wins on. My husband and I also like Wolf Run a lot. Of the new slots these days, I really like Aladdin for the fun bonuses and the fact it can pay off big on a $1.20 bet if lucky. I'm also liking the new Michael Jackson and Grease slots for the fun factor and of course because if lucky one can get a good pay off from them.